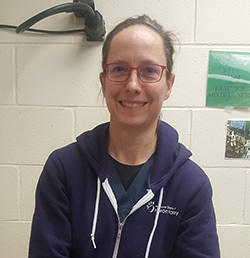 Dr. Sara Vogler received her undergraduate degree from Dartmouth College, her PharmD degree from the University of Michigan, and her DVM from Michigan State University. She was employed as a nuclear pharmacist before pursuing a career in veterinary medicine. Her past volunteer endeavors include dog walking at HSHV. She loves working as a shelter veterinarian at HSHV as it allows her passion to also be her livelihood — helping animals in need. She lives in Ann Arbor with her husband, senior Great Dane (Willow), and brother cats (Cheetah and Panther). Her current hobbies (obsessions) include tennis, yoga, biking, and visiting museums.